The Vega Owners Repair and Maintenance Manual is a treasure trove containing the combined accumulated knowledge of the members of the American Vega Association and its predecessor, the Vega One Design Chesapeake Assn. (VODCA). Rest assured, sometime in the past thirty-plus years, someone has come across the same problem you are looking at today and has come up with an answer; in some cases more than one answer. Realizing this, the members of VODCA and the AVA continue to collect and publish answers to the questions we all find ourselves asking at one time or another as we maintain and upgrade our boats. The VORM is the archive of those answers, tips, tricks and solutions. Some of the material was originally published in the 1970s and is a bit dated. All is included here. We hope that current members will continue to contribute as new tools, materials and techniques emerge. 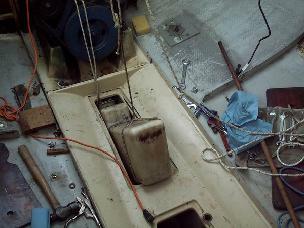 The most recent article, Replacing Standing Rigging, was added in the Summer of 2008. DISCLAIMER: The AVA makes no representation of accurracy or appropriatness of any recommendations in these articles. Further, the American Vega Association, its officers and members make no warranty or other promise regarding the contents of the VORM and assume no liability in relation to its contents.